The Ambassador of France to Vanuatu, Mr. Robby Judes paid a courtesy visit to the Vatu Mauri Consortium, Vanuatu Human Rights Coalition and Vanuatu Young Women For Change (VYWC) on Monday, February 4, 2019. The Executive Board and members of the three Civil Society Organisations (CSOs) gladly received the French Ambassador. The chiefs, women leaders and Youth leaders showed their appreciation by warmly welcoming Ambassador Judes with fresh salusalus, a mat and calicos. In his remarks, Ambassador Judes said he is interested in the work of Women and Human Rights. During the discussions, Ms. Anne Pakoa Acting CEO of the Vatu Mauri Consortium and CEO of the Vanuatu Human Rights Coalition and Technical Advisor for the VYWC briefed Ambassador Judes of the different programs and activities each of these organisations work on which includes the upcoming manioc project for the Tokoshefate Farmers Association, the Rights of victims of displaced people and communities and the VYWC ‘Storian Insaed Long Nakamal Project’ which is a project led by VYWC and over 18 chiefs to ensure women representation in the National Parliament in 2020. 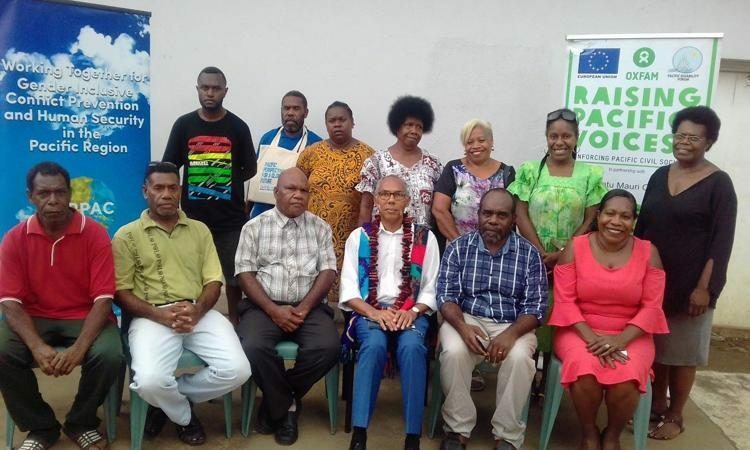 During the discussions, Mr Joe Kalo, CEO of the Vanuatu National Youths Council (VNYC) raised the importance of VNYC taking lead on the celebration of La Francophone activities while Mrs Alice Kaloran, President of Tongoa Shepherds Women Association spoke about the work they do on empowering women economically. Ambassador Judes said he is looking forward to a concept note to be provided to him by Ms Pakoa which should incorporate current programmes and activities of these NGOs.